Earth science coursework is contextual and relevant in today’s geospatially connected world. ArcGIS Online assignments are a perfect fit for earth science courses. GIS helps develop and strengthen students’ geographic awareness and spatial thinking skills. Southwestern College (SWC) in Chula Vista, California, is so named because it is located in the southwestern corner of the continental United States—12 miles south of the city of San Diego and 8 miles north of the US-Mexico international border. The college serves approximately 400,000 residents within the district, which encompasses the communities of the southern urban section of San Diego County. The total annual enrollment at SWC is around 30,000 students, and the average student is 25 years old. Eighty-one percent of all SWC students are ethnic minorities, with Hispanics comprising 56 percent of the student body. SWC is listed as a Hispanic Serving Institution. Locations of vineyards around the world (ArcGIS Explorer Online). In 2012, the college was selected as an Esri ArcGIS Online for Education grant winner. As a result of the grant, two new ArcGIS Online projects have been created and are now incorporated into all the college’s earth science general education courses, including Physical Geography, Geography of California, Cultural Geography, World Regional Geography, Weather and Climate, and Introduction to Earth Science. These are the college’s most popular general education courses, with nearly 2,000 students enrolled annually. Although the popularity of SWC’s earth science courses can be attributed to a number of reasons, perhaps the most important part of their success is that earth science coursework is contextual and relevant in today’s geospatially connected world. With the advent of online mapping and location-specific computer applications, geospatial technologies and geography itself are more familiar to the general public, while geospatial disciplines are becoming more and more popular among college students. With this in mind, the new ArcGIS Online assignments are a perfect fit for SWC’s earth science courses, providing an easy-to-use, robust tool for students not only to learn earth science but also to develop and strengthen their geographic awareness and spatial thinking skills. Each project is self-contained and includes step-by-step instructions to help the students explore the related data and perform a series of exercises. 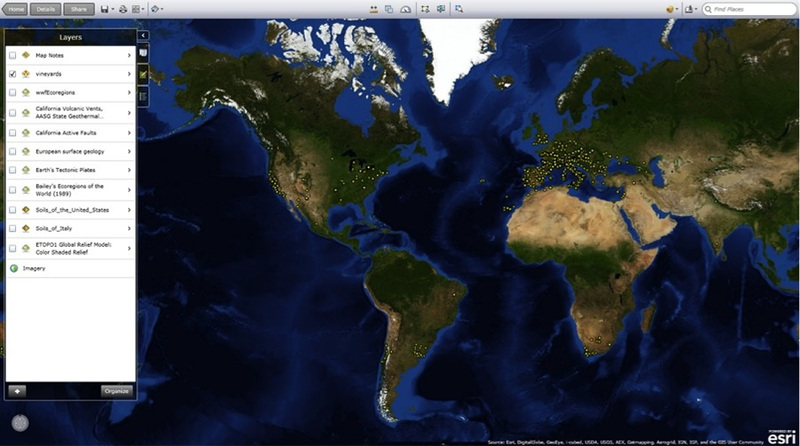 Beyond ArcGIS Explorer Online and the layers of data that can be directly added to maps from the ArcGIS Online data warehouse, no additional software or data is required. The projects take two to four hours to complete. Visualizing the SWC Student Community—Examining address and demographic data with ArcGIS Explorer Online, students gain fundamental insight into the economic and sociological characteristics of their college. Using the standard postal code data from the United States Postal Service and the SWC student admissions data, a database was created of the locations where SWC students lived from 2007 to 2011. This included another data layer containing demographic information with the socioeconomic breakdown and ethnicities for each postal code. Exercises include statistical analyses of student residence locations, the examination of income levels and ethnicity, proximity to fault zones, location/climate characteristics, and the location of local transportation corridors. Example of vine spacing, density measurement (ArcGIS Explorer Online). Comparing and Contrasting Wine-Making Regions in Tuscany and San Diego County—In this module, students explore the variables of wine making, paying special attention to soil, climate, and topographic characteristics. A shapefile map was created that includes the majority of vineyards in the world. 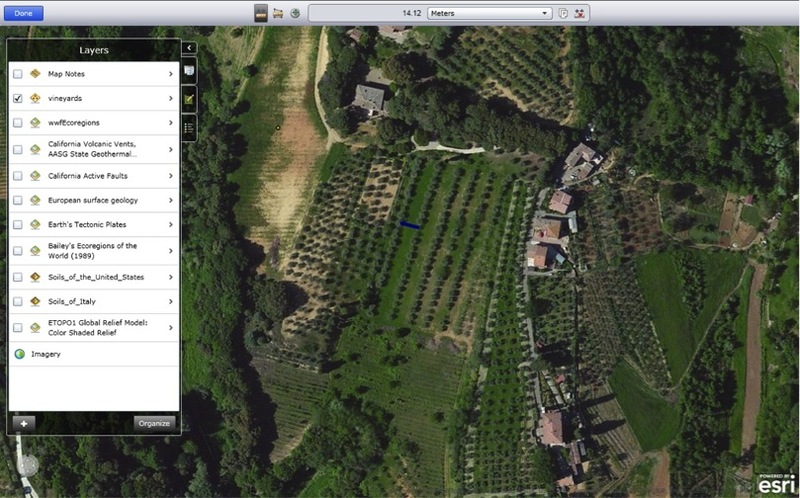 By clicking the dot representing a vineyard, information about it is displayed. Students map the location of vineyards in Tuscany, Italy, and San Diego County and overlay those locations with climate, soil, and geologic data. Then, the two wine-making regions are compared. Students not only analyze environmental data but also use ArcGIS Explorer Online to discern more specialized information, such as the measurement of vine density. Anecdotally, beta testers did better on those portions of the class exams that included geospatial technologies, demographic analysis, and natural vegetation topics by about 5 percentage points over other members in their respective classes. Although there are other variables to consider, it is a reasonable conclusion that the ArcGIS Explorer Online projects aided in student success. Ultimately, those are the desired outcomes—students becoming engaged in a project, enjoying the learning process, and actually learning. Both these projects are included in spring 2013 SWC earth science classes. In addition, the projects were sent to all SWC instructors so that they could incorporate them into their own disciplines, where possible. Presently, requests are coming in from instructors across a variety of disciplines to help build additional learning modules. With that in mind, the following projects are currently being worked on: Erik the Red and the Norse Greenland Tragedy—What Happened and Why? and The Spread of Humans Around the World, based on part I of the book Guns, Germs, and Steel by Jared Diamond. ArcGIS Online across the campus of Southwestern College is helping to promote interactive learning, geographic awareness, and spatial thinking to thousands of general education students each year. Ken Yanow, professor of geographical sciences at Southwestern College in Chula Vista, California, has master’s degrees in both geography and astronomy. He leads the GeoTech Center’s efforts to promote minority and female recruitment in geospatial technology programs nationwide. For more information, contact Ken Yanow, professor of geographical sciences, Southwestern College.